Mindpowerjewels - Infuse your life with Love, Beauty and Grace! Rebbie has created a fabulous set of resources you'll be benefiting from over and over again. She calls her program YOFA, which means Yoga of Alignment. Rebbie keeps creating new tools for expanded consciousness and joyful manifestation. I am using the YOFA material with great benefits and I can't say enough good things about it. It's absolutely amazing! Rebbie is a very warm hearted, loving meditation coach and one of the rare teachers who is even personally approachable, if you have any questions or wishes. She bases her work on the teachings of Abraham and is an Abraham coach. Her work does not only teach you to meditate - but by applying her material you will actually LOVE to meditate! You will learn how to align yourself with your divine source and remain aligned in your daily activities. By naturally enfolding your true self and expanding your conscious awareness, becoming the blissful being that you truly are, you will find yourself growing effortlessly and joyfully into a master of manifesting the life of your dreams. 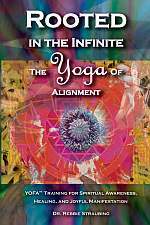 The core of Rebbie's work is her wonderful book "Rooted in the Infinite", that teaches how to meditate by loving to meditate. Learn how to connect your roots to the infinite supply of bliss, health, joy, prosperity, and relationships. To go even deeper you should check out Rebbie's Virtual Workshop The Art of Joyful Manifestation, which leads you to your own source of all answers by a new way of listening. If you are still looking for your soul mate, if you want to find out how to manifest a soul-satisfying relationship, even if you think you've already tried everything, then the Miracle Tools for Great Relationships course is for you. It's a membership site, that provides three learning modules, for just a low one time fee. One of the important keys - if not THE key - to unlock your full potential, is to love yourself. A wonderful tool that can help you grow self-love and self-appreciation is Rebbie's set Affirmative Contemplation. These are gentle, lightful songs, that you can listen and sing and instantly feel love flowing through your every cell. I have them in my MP3 alarm clock, so the first thing I am waking up with is love - a great way to start the day! Also, don't forget to sign up for Rebbie's free 7 Secrets Course. It's a beautiful introduction to the YOFA system and you can start right away applying it to your life. A Bonus Free subscription to Mindpowerjewel's tips (valued at $197 per year)! Your privacy is as important to us as our own. Your details will NEVER be sold, traded or otherwise disclosed to any third party. whales and the power of love. Watch Mindpowerjewels Manifestation Movie and get charged with positive energy! Jewels for every day. Pick up your jewels and infuse your day with beauty and grace!